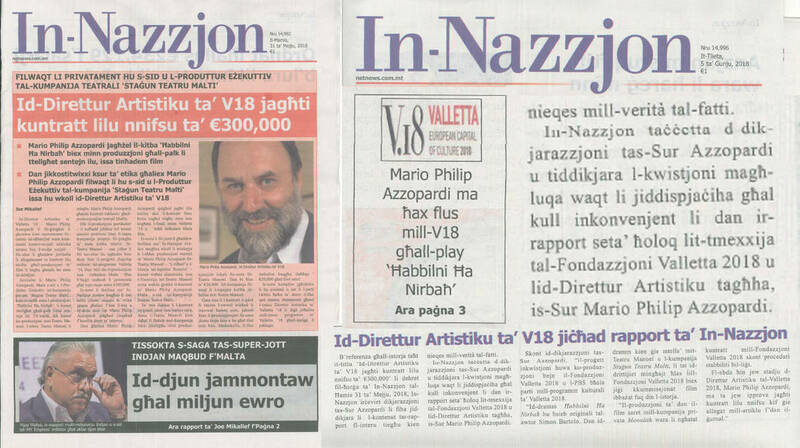 The Valletta 2018 Foundation is reproducing an apology, published today Tuesday 5th June “Id-Direttur Artistiku ta’ V18 jiċħad rapport ta’ In-Nazzjon” from the editor of In-Nazzjon on a report the article entitled “Id-Direttur Artistku ta’ V18 jagħti kuntratt lilu nnifsu ta’ €300,000” which was published on Thursday 31st May 2018 on In-Nazzjon’s front page. The Valletta 2018 Foundation last week categorically denied this report by In-Nazzjon as a made-up story which lacked any truth and facts completely. Whilst the Foundation appreciates that In-Nazzjon has regretted publishing this report and the inconvenience this caused to the Foundation and to Mario Philip Azzopardi, it reiterates that the Valletta 2018 project will keep being a project for all, as it has always been. The Valletta 2018 Foundation regrets to see stories of this sort which definitely are not in the best interest of the entire nation.